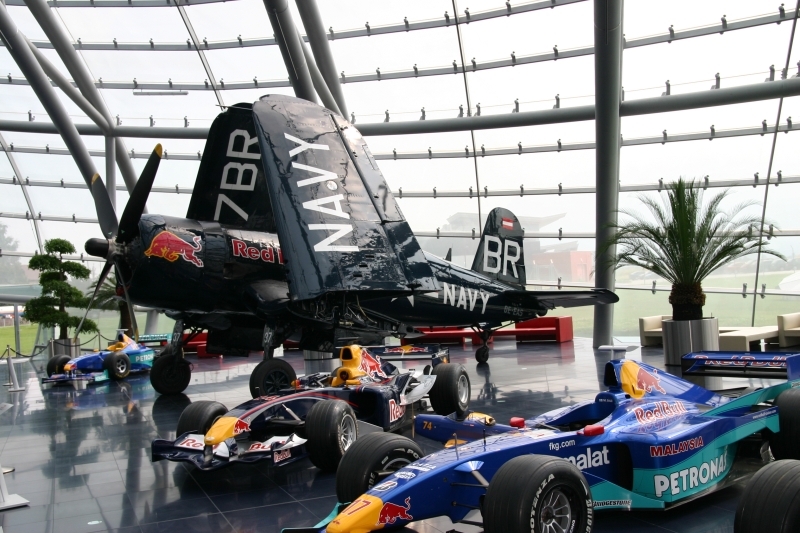 The Big Doug of Salzburg's Red Bull once again visited Amsterdam IAP. 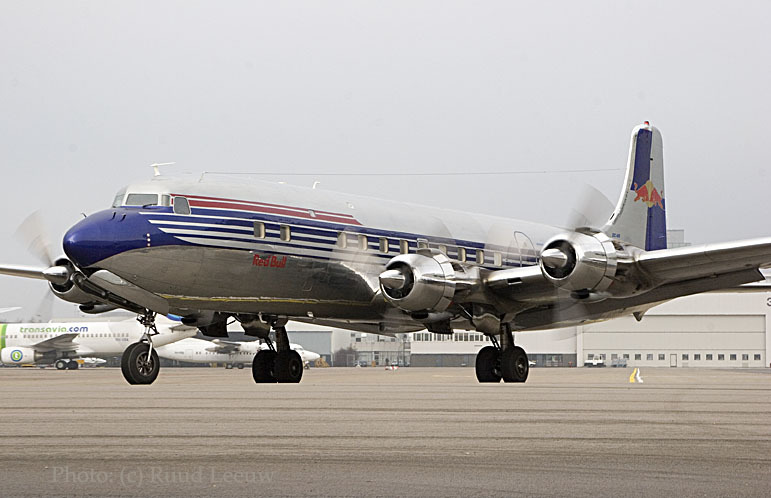 DC-6B N996DM (c/n 45563) has been restored almost beyond perfection. 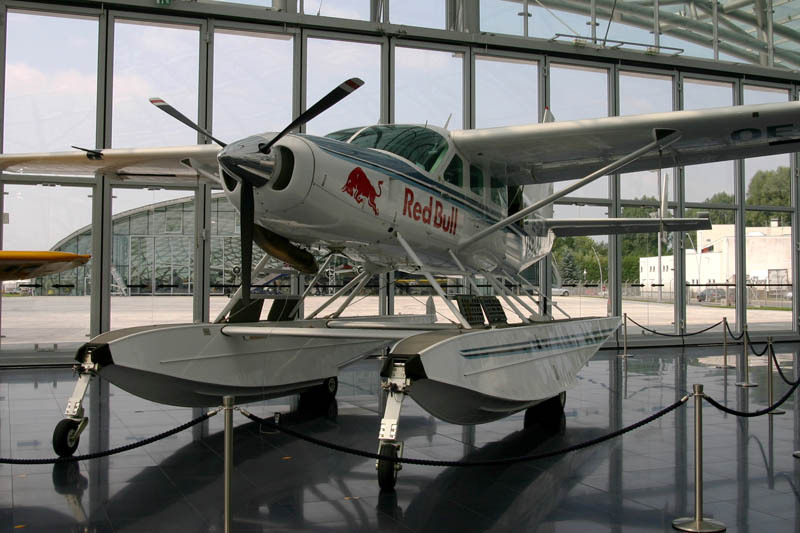 Further below, in the account of N996DM's visit earlier this year, one can read more specific details about its history and about Red Bull. With a puff of smoke no.2 engine is being started. 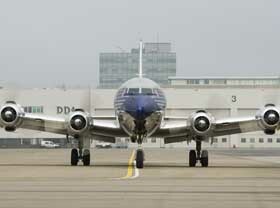 N996DM looks almost too clean, too shiny for such a vintage airliner; but who is to complain ?! 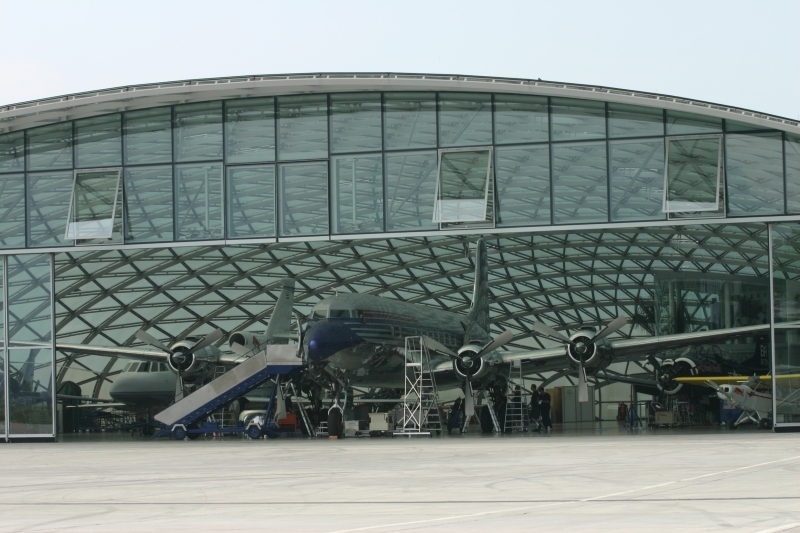 Aviation history well preserved I'd say!! 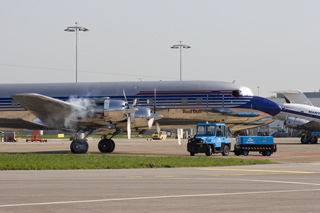 Since the Sixes of Air Atlantique are less active (one for sale even), this Douglas Six has become even more unique here in Europe. I was told Air Atlantique's G-SIXC is stored and for sale while G-APSA will be flying at Coventry on 14Dec06 at the Air Atlantique press day; In fact, G-APSA still technically belongs to Instone, the world's oldest airline, and is not for sale. Always pleasing to the ear, the somewhat muffled rumbling of the radials pounding its heavy rhythm going past. 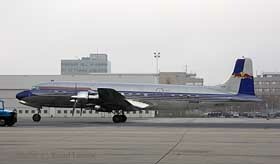 "The DC-6, DC-6A and the military versions all had the ’small’ forward cargo door. 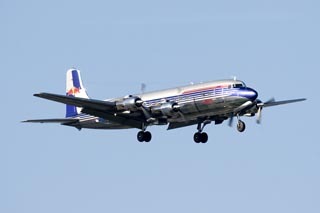 The DC-6B had the ’big’ forward cargo door. There were indeed a cargo compartment aft of the cockpit, although it was optional. 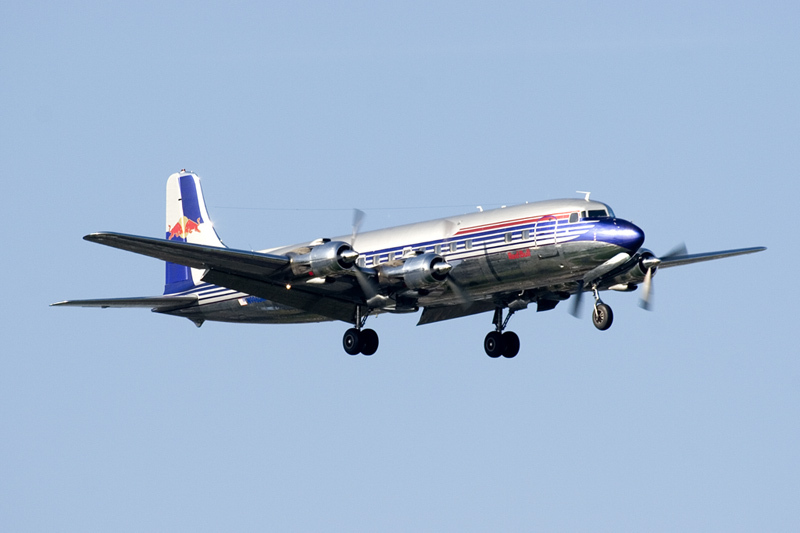 G-APSA is a DC-6A, hence the ’small’ forward cargo/crew door. 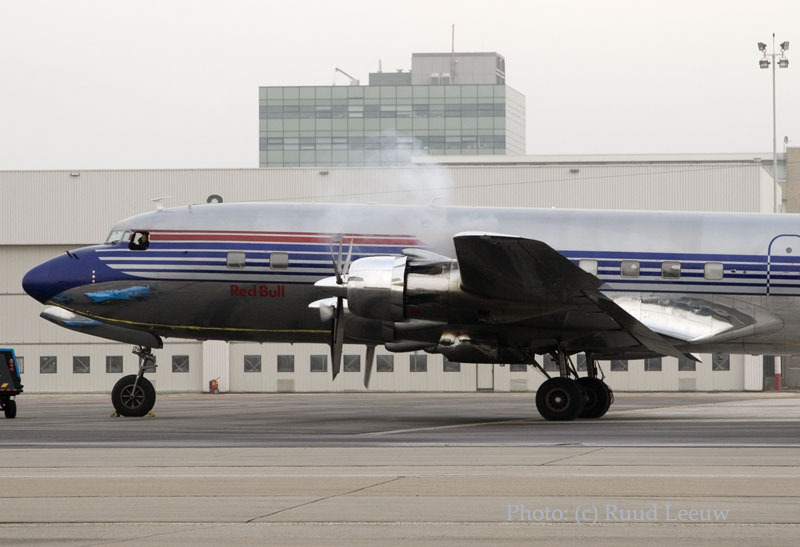 N996DM (Red Bull) is a DC-6B, hence the ’big’ forward cargo/crew door." 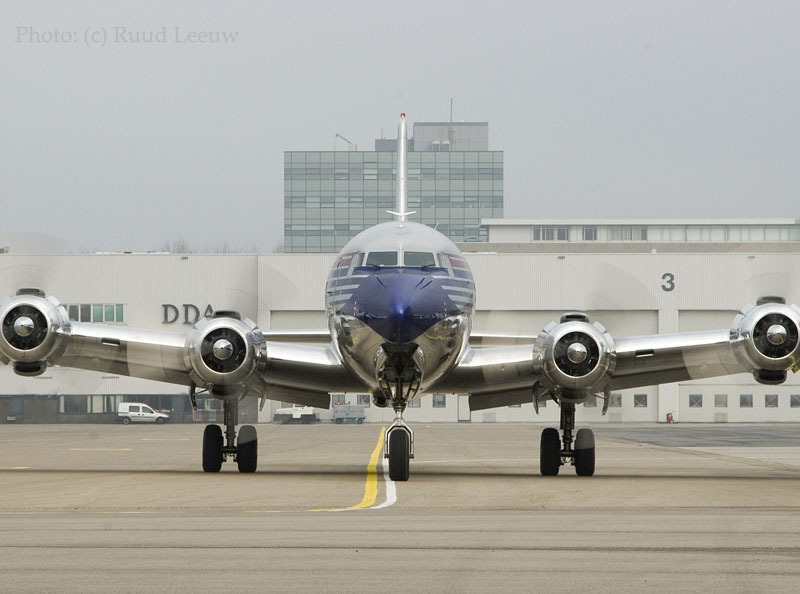 The Red Bull DC-6B made the return flights Salzburg - Amsterdam on 30Nov and 01Dec carrying a load of Red Bull employees who had won a competition and as a result were treated to a trip to Holland to explore the city of Amsterdam. In return some of the Dutch Red Bull employees travelled back to Salzburg for a day and night in Austria! The cockpitcrew consisted of Captain's Julian Firth and Raimund Riedmann (each taking a turn in the lefthand seat, AMS/SZG and SZG/AMS; Flight Engineers Thomas Muigg and Andrew Chambers also took turns as "Flight Engineer in charge" on SZG/AMS v.v., on Thursday 30Nov and Friday 01Dec. Cabincrew consisted of Barbara (number 1) and Tanya both days, plus Regina on Thursday and Stephanie on Friday. We hope for many returns! 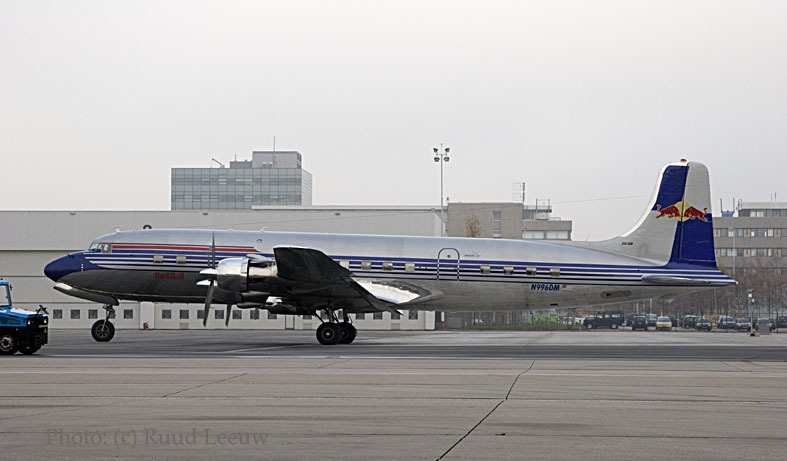 On this fine April morning I was at the ready in the approach of runway 36R at Amsterdam IAP, for the arrival of this exquisite classic airliner: N996DM (c/n 45563) owned and operated by the Flying Bulls (Red Bull) of Salzburg,Austria. When "november-niner-niner-six-delta-mike" made contact with Schiphol Tower, I heard them requesting a break off for runway 04, which was approved without hesitation; this would facilitate a speedy arrival to the DDA ramp at Schiphol-East. 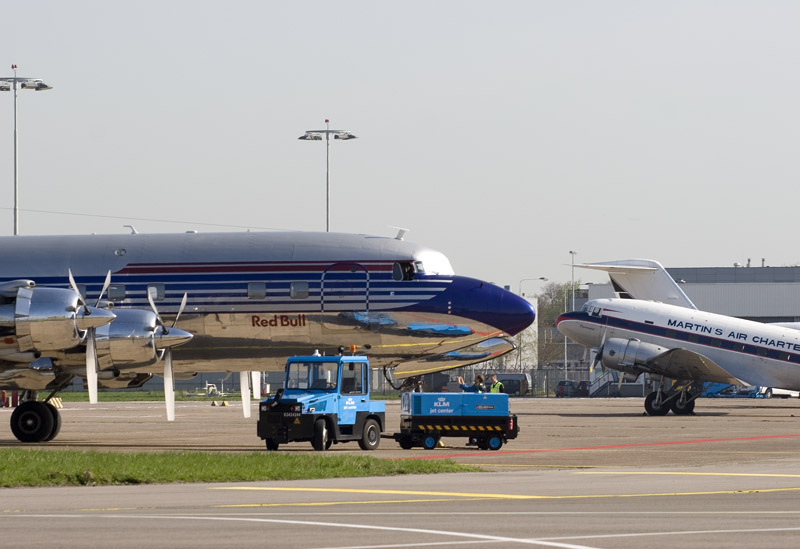 The DDA Classic Airlines played host to this special flight of the "Flying Bulls' Six"
This part of Amsterdam IAP is also the place to refuel avgas; I don't think you will be able to get any at "Schiphol-Centre", where the main passenger terminal is and airliners and freighters find their business. 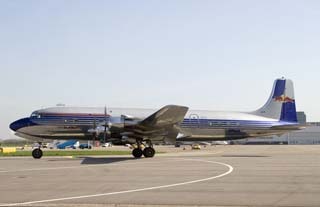 Douglas delivered c/n 45563 (line number 1034) to Jugoslavenski Aerotransport on 24Nov58 where it was registered as YU-AFB. 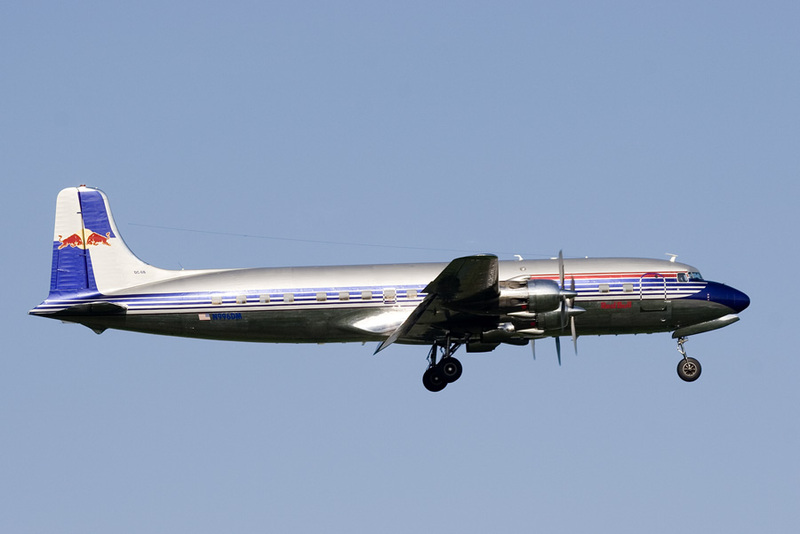 In 1961 it was transferred to the Yugoslav Air Force and obtained serial 7451; it was reserialled 73101 in 1969 and again in 1973 as 7511. 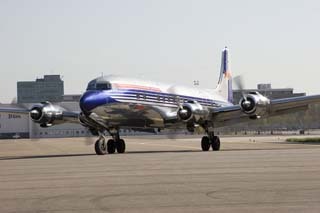 Two years later, in 1975, it was donated to the Zambian Air Force, where it obtained registration GBM 110. Much later, in Jan.1994, it was bought by Namibia Commercial Aviation which registered it as V5-NCF; it was leased to Air Namibia in July 1996. 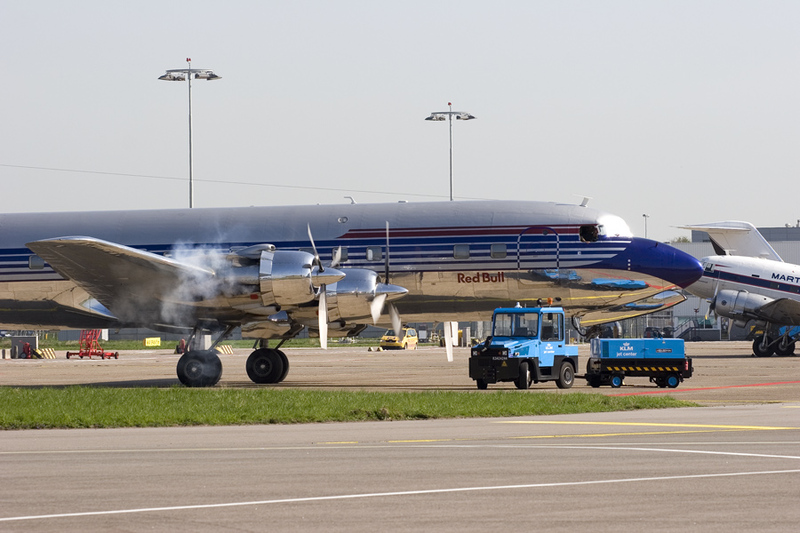 The Flying Bulls Gmbh of Salzburg,Austria made it return to Europe when they purchased it in June 2000; tailnumber OE-IDM was not taken up, instead it was registered N996DM on 04Apr01. Source: Piston Engine Airliner Production List by A.B.Eastwood and J.Roach (TAHS, 2002). Polished to the hilt, N996DM leaves the ramp for departure. 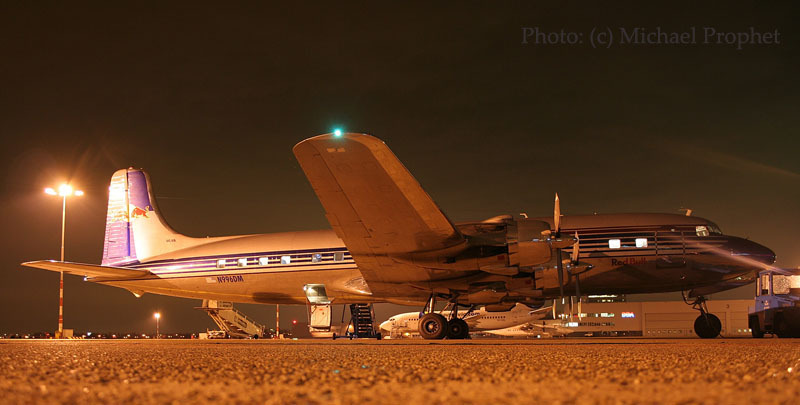 It is no coincidence this DC-6 is shining bright: it underwent an extensive and most thorough restoration in Salzburg. I am sure its superb apperance extends far beyond the superficial and in such condition it should be able to grace the European skies for many more years ! I really enjoyed the rumbling sound of the radial engines when it taxied past. When in the services of the Namibia Commercial Aviation it enjoyed the company of a sistership: V5-NCG (c/n 45564). 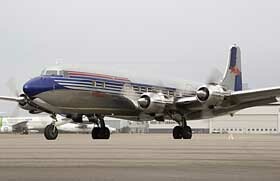 Unfortunately this fine vintage DC-6 looks upon a slight less rosy future: read all about this! 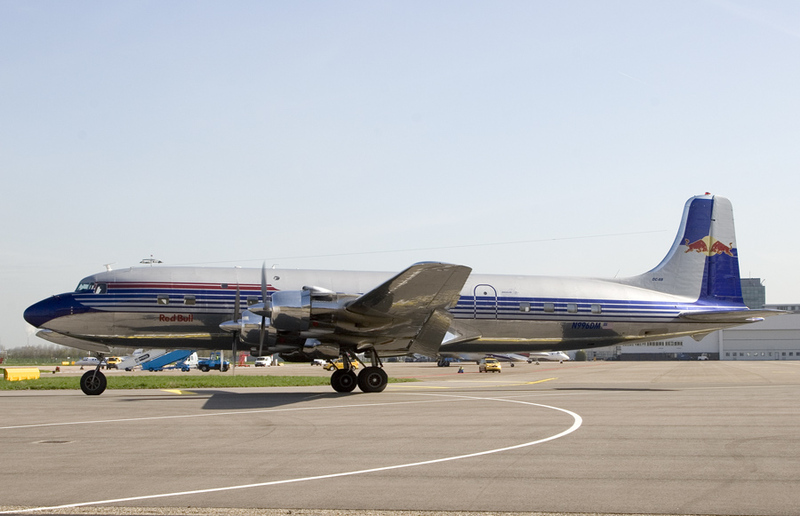 Considering this and the fact that these two are the sole surviving DC-6s in passenger configuration, one can only be grateful for people taking the effort to preserve these unique Classic Airliners. Donald van Zonneveld was there too, except he had a video camera with him.. He posted an excellent result on YouTube. 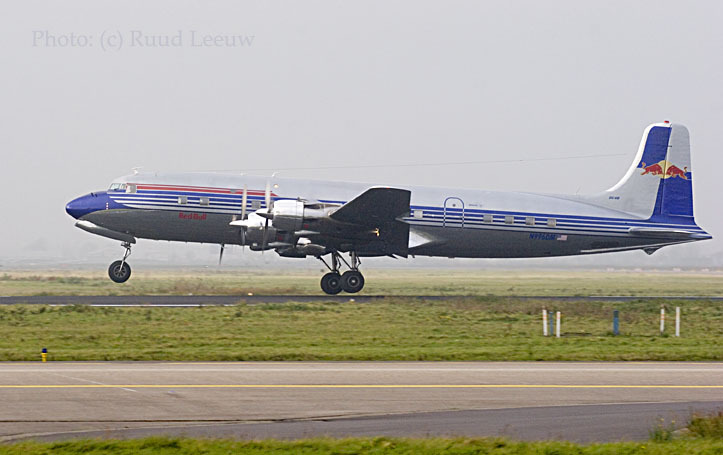 Soon after N996DM went airborne for Groningen, in the north of the Netherlands. It was scheduled to arrive back at Amsterdam that same day, afterwards it continued to homeplate, Salzburg. The crew and organisation could look back upon a job well-done. Special thanks to Marco Rietveld for tipping me on N996DM's schedule for this day. 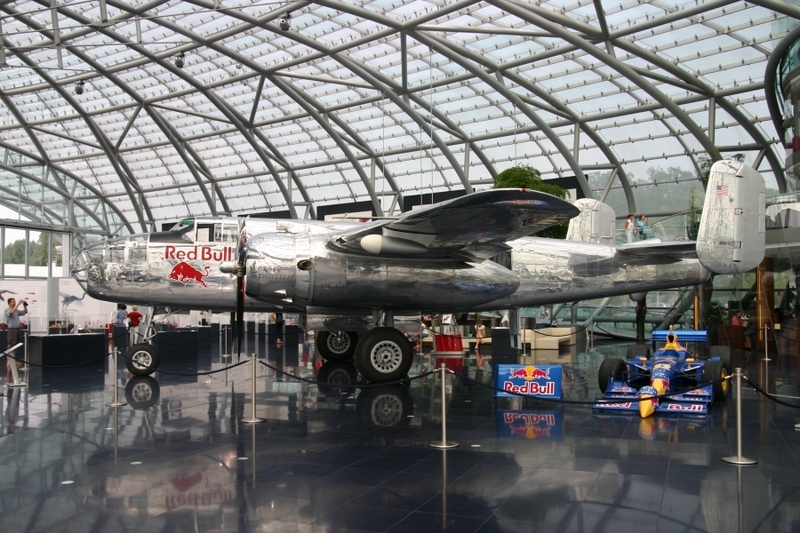 During the summer of 2005 I was driving from Amsterdam to Vienna via Munich; after I left Munich I decided to make a detour to visit the Flying Bulls museum at Hangar 7, located at Salzburg Int'l Airport. Unfortunately, no one was available to authorize a visit to the DC-6 in the maintenance hangar. I had come unannounced and the single person who could authorize anything was in a meeting, not to be disturbed. 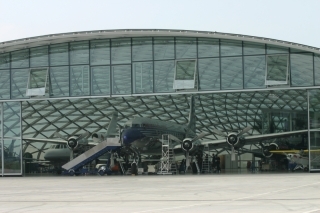 Mr Raymund Riedmann wrote me in explanation: "I am sorry you were not able to come over to our (maintenance) hangar-8; I hope you understand that as a rule it is not allowed to walk over: that area is not part of the museum and we have to abide by safety- and security regulations of the Salzburg airport. The security people are not allowed to let visitors pass." (replace -AT- by the @ symbol). Sorry for the inconvenience, but this is because spam has increasingly become a problem.